Create a custom "Fanciful Image" or choose from Diane's large selection of beloved companions. Please contact Diane for details. Look around these galleries and her shops for fun animal paintings. Diane's "Fanciful Animal Images" are available as mugs, totes, tiles, buttons, pendants, journals and more at Diane's CafePress Shop (new window). You can even decorate your whole room with Diane's cute images with duvet covers, rugs, curtains and pillows. At Diane's Zazzle Shop (new window) you will find lots more pillows, messenger bags, iPhone covers, iPad cases, plates and real US postage! Cards and prints are at Diane's Etsy Shop (new window). These are exciting places worth checking out! Ask for what you don't see! See More Below the Kitty! Diane says, "As a passionate animal lover, I understand the importance of the relationship between humans and animals. Our "Fanciful Images" allow you an imaginative way to celebrate that specialness." Diane Clancy can work with your own photo or Diane's In-House Photographer, Susan Elkin, can photograph your animal companion. Diane would be delighted if you contact her for details. 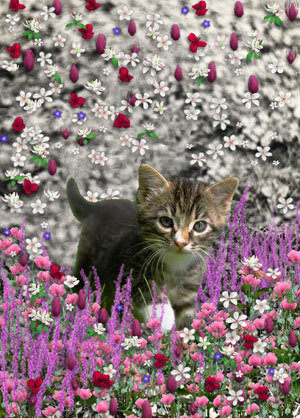 Diane Clancy takes your image of your animal companion and places them with flowers or butterflies. Other enhancements are available. Marie-Françoise Walk says, "It was a lot of fun to work with Diane on a project I dreamed up for my daughter's birthday: I had a lovely photo of my daughter's cat Mimosa, and also a shot of a mimosa tree in Italy. Diane combined the two at my request, and when the result just didn't look very exciting, Diane used her artistic touch to add flowers from her own collection. She consulted me on various iterations of the composition until we were both happy with the result. The final product is whimsical, fresh, happy, and a source of joy for my daughter."